Robert William Gary Moore, known simply as Gary Moore, was a Rock musician . One of rock's most underrated guitarists (both from a technical and compositional point of view), Gary Moore remains relatively unknown in the U.S., while his solo work has brought him substantial acclaim and commercial success in most other parts of the world -- especially in Europe. Moore became interested in guitar during the '60s, upon discovering such blues-rock masters as Eric Clapton, Jimi Hendrix, and perhaps his biggest influence of all, Fleetwood Mac's Peter Green. After relocating to Dublin later in the decade, Moore joined a local rock group called Skid Row, which featured a young singer by the name of Phil Lynott, who would soon after leave the group to double up on bass and form Thin Lizzy. Skid Row persevered, however, eventually opening a show for Moore's heroes, Peter Green and Fleetwood Mac, and making such an impression on the veteran group that Green personally requested their manager help secure Skid Row a recording contract with CBS (in addition, Green sold Moore one of his most-used guitars, a maple 1959 Gibson Les Paul Standard, which would become Moore's primary instrument). Moore proved to be quite busy in 1978, as the guitarist appeared on three other artists' recordings -- Andrew Lloyd Webber's Variations, Rod Argent's Moving Home, and Gary Boyle's Electric Glide. The same year, Moore issued his second solo release (almost five years after his solo debut), Back on the Streets, which spawned a surprise Top Ten U.K. hit in May of 1979, the bluesy ballad "Parisienne Walkways," and featured vocal contributions by Lynott. Moore joined forces with his Lizzy mates once more in 1979, appearing on arguably the finest studio album of their career, Black Rose, which proved to be a huge hit in the U.K. (for a fine example of Moore's exceptional guitar skills, check out the album's epic title track). But predictably, Moore ultimately exited the group once more (this time right in the middle of a U.S. tour), as a rift had developed between Moore and Lynott. Undeterred, Moore lent some guitar work to drummer Cozy Powell's solo release, Over the Top, in addition to forming a new outfit, G Force, which would only remain together for a lone self-titled release in 1980. Over the years, Gary Moore has been the subject of countless compilations, the best of the bunch being 1998's metal-oriented Collection and 2002's blues-based Best of the Blues, as well as Out in the Fields: The Very Best of Gary Moore, which was split 50/50 between his metal and blues excursions. Teaming with Skunk Anansie bassist Cass Lewis and Primal Fear drummer Darrin Mooney, Moore started work on much harder and alternative-influenced rock in the spring of 2002 and released the results as Scars. The powerful Live at Monsters of Rock from 2003 proudly declared "no overdubs used" while 2004's raw Power of the Blues featured nothing but the blues, as did 2006's Old New Ballads Blues on Eagle Records. While he was on holiday, Moore died on 6 February 2011 in Estepona, Spain. 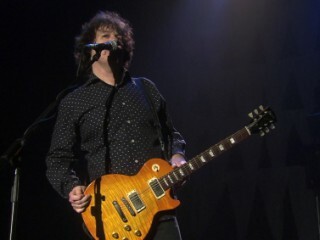 View the full website biography of Gary Moore.